Every now and then something magical happens. No, we’re not talking about finding a $1,000 bill on the ground. Although, that would be all kinds of magical. 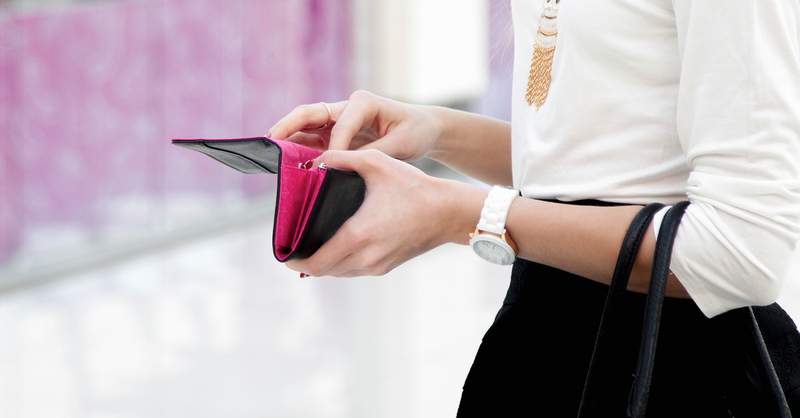 We’re talking about the pleasant surprise of finding leftover money in your budget! Maybe gas prices went down or the weather was incredible and you didn’t have to run your air conditioner as much. Or maybe you simply landed a flash sale on your vacation must-reads. Whatever the awesome reason, now you have more cash to spend, save or give in your budget. After you finish your happy dance, make sure you put that money to good use right away. Wondering where should it go? Speed Up Your Progress. If you are on Baby Step 1, 2 or 3, we recommend putting that leftover money toward your current Baby Step. For example, with an extra $100 a month, you can pay off a $10,000 student loan a little over five years earlier! Plus, you’ll end up saving $1,500 in interest while you’re at it. See ya, debt. Give It a Good Home. If you’ve finished Baby Step 3 and have your full emergency fund in place, you may want to put the money toward a fun expense like your upcoming beach trip. Or that new jacket you’ve been eyeing at Nordstrom Rack. Or your car insurance bill (not as fun, we admit, but you’ll probably score the lump-sum payment discount!). You could even surprise a friend who’s having a hard time with a gift card to his or her favorite place. It’s your call! Treat yourself. Another option is to roll the leftover money into next month’s budget. Let’s say you’re $75 under in your restaurant budget because you caught the grilling bug this month (yum). Put the extra money in next month’s budget to treat yourself to a table at one of those fancy, trendy spots you never visit anymore! 1. Adjust As You Go. Let’s say it’s the middle of the month and you planned $70 for water/sewer, but your bill was only $50 (nice!). Don’t wait until the end of the month to budget that money. Go ahead and pull up your EveryDollar budget, and adjust your “planned” column to reflect the new amount. Then put that extra $20 elsewhere. The benefit of changing your budget as you go is that your money never sits around waiting to work for you. It’s active all month long! 2. Give It Another Overall Glance. At the end of the month, it’s a good idea to double-check your budget for leftover cash. To find it, look at the helpful charts in your EveryDollar budget where you see your income. 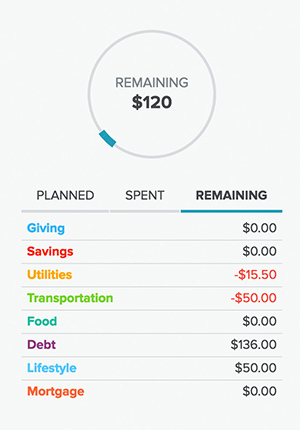 You’ll notice three categories: “planned,” “spent” and “remaining.” Click the “remaining” tab to see your leftover cash. If it says $30 (oops, you forgot to get that haircut! ), go ahead and assign your extra money to next month’s budget. When you give every dollar a name, you’re in control of your money at all times. If you’re able to spend less than you planned on a given category, that’s a great opportunity to save, eliminate debt, or be a generous giver. Go you! Don’t have an EveryDollar budget yet? No problem. It’s free to create your budget and takes less than 10 minutes. The savings you find will make it more than worth your time!